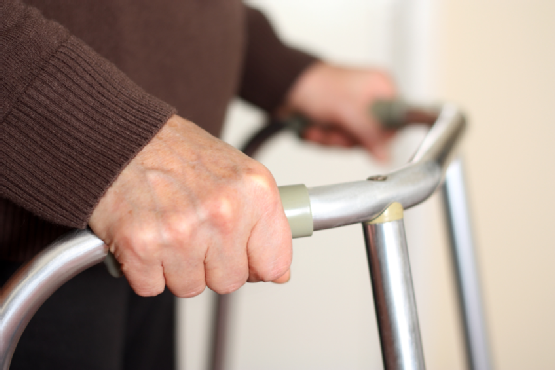 When using your walker, you don’t want to be hunched over or leaning over its bars. To ensure you can maintain a comfortable posture, adjust the walker so it fits the length of your arms comfortably. This also helps protect your shoulders and back from extra stress. When you place your hands on the grips of your walker, your elbows should bend at a comfortable 15-degree angle. You may need to shift your weight onto the walker as you take your first step. Just make sure to keep your back straight as you move forward. The next step is placing one leg inside the walker, using your arms to keep it still as you step inside. After your first leg is secure, you can place the other leg on the inside of your walker. Keep repeating the process in order to move your walker forward. One way to make your walker easier to use is by attaching some simple accessories. For example, you can attach a pouch to the side of your walker for carrying books, magazines, and other personal items. Just make sure you don’t overload any of these storage spaces, as this can make your walker more difficult to use. For more than 60 years, Williams Lift Company has provided New Jersey residents with the best stair lifts, chair lifts, and ramps. Our staff is dedicated to helping you find the right mobility aid to enhance your life. For more information, give us a call at (908) 322-7070.